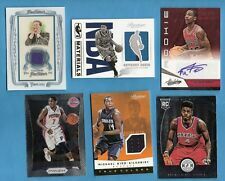 2012-13 ANTHONY DAVIS PANINI BRILLIANCE ROOKIE RC SPELLBOUND LETTER V & A Lot of (2) RARE NOLA. Condition is Brand New. Shipped with USPS First Class Package. 2012-13 Panini Nba Hoops Anthony Davis rookie Card BGS Grade 9.5 Gem Mt. Condition is Brand New. Shipped with USPS First Class Package. Thanks for looking here offered is a 2012-13 Panini Past & Present Shattered Anthony Davis Rookie Card #32 Hornets RC. This card is in excellent condition and comes shipped as seen in the photos above. Comes shipped in a soft sleeve and top loader in between cardboard in a bubble mailer via USPS First Class Mail with a $4.00 shipping fee if shipped in the USA. International purchases have a EBay Global Shipping Program fee as well as the $4.00. Get this Rare Rookie Card of these beloved New Orleans Pelican & NBA All Star while it lasts. The Card in the photo is the actual card you will receive. 2012-13 Crusade #88 Anthony Davis Rookie Card RC Nola!!! New ListingANTHONY DAVIS 2012-13 12/13 Panini Limited RC AUTO SSP # /10 RPA 2012 ROOKIE!!!! ANTHONY DAVIS 2012-13 12/13 Panini Limited RC AUTO SSP # /10 RPA 2012 ROOKIE!!!!. Condition is Brand New. Shipped with USPS First Class Package. JOHN CALIPARI. MARQUIS TEAGUE. AUTOGRAPH CARD (#6) FROM MARQUIS TEAGUE. DORON LAMB. PANINI CRUSADE QUEST ROOKIE. ROOKIE EVENT USED BASKETBALL PIECE CARD, A. 2012-13 PRESTIGE ROOKIE. PANINI PRESTIGE ROOKIE CARD (#242) FROM DARIUS MILES. NATIONAL TRADING CARD CONVENTION ,AND A. NATIONAL TRADING CARD CONVENTION. 2 012-13 PANINI ROOKIE. WORN HAT PIECE RELIC. WORN HAT PIECE RELIC CARD (#14). THATS RIGHT ONLY 498 OTHER PEOPLE CAN OWN A CARD LIKE THIS ONE. NERLENS NOEL. JOHN CALIPARI. MARQUIS TEAGUE. CARD(#236) FROM MARQUIS TEAGUE. THATS RIGHT ONLY 298 OTHER PEOPLE CAN OWN A CARD LIKE THIS ONE. sure to increase in value as. THESE CARDS would be a great addition to any collection, and is. PANINI BRILLIANCE. TOTALLY CERTIFIED. You are buying 2 CARDS. ROOKIE CARD OF. THESE CARDS would be a great addition to any collection, and is. ROOKIE CARD (#234). sure to increase in value as. WILDCATS STAR. Very nice card. Card will arrive top loader protected inside a padded envelope. Shipping to a United States is $3.50. If you have any questions please feel free to ask. Thanks for your interest and take care. It is in Near Mint-Mint condition. You will receive the exact card pictured. PANINI MOSAIC. PRIZM CERTIFIED AUTHENTIC AUTOGRAPH CARD, A PANINI IMMCAULATE. PRIZM CERTIFIED AUTHENTIC AUTOGRAPH CARD. ROOKIE CARD OF. ROOKIE CARD (#237). You are buying 3 CARDS. THIS CARD IS NUMBERED. PAST & PRESENT 1-150 (DOES NOT INCLUDE ANY OF THE ROOKIE SHORT PRINTS 151-250) NOT PICTURED. ELITE 1-200 (DOES NOT INCLUDE THE SHORT PRINT #'D ROOKIES 201-300). PRESTIGE 1-150 (DOES NOT INCLUDE THE SHORT PRINT ROOKIES 151-250). DEMARCUS COUSINS. FEATURING ROOKIE JERSEY PIECES OF JOHN WALL & DEMARCUS COUSINS. DUAL ROOKIE JERSEY CARD. PANINI COURT KINGS. DUAL ROOKIE JERSEY CARD (#6). THE CARD IS NUMBERED 86. THATS RIGHT ONLY 398 OTHER PEOPLE CAN OWN A CARD LIKE THIS ONE. • Ungraded Card - 25¢. • Graded Card - 50¢. • Ungraded Card Lot - 50¢. THIS CARD HAS HUGE POTENTIAL SO INVEST NOW! BRADLEY BEAL. 2012-2013 TEAM PINNACLE DUAL ROOKIE CARD. 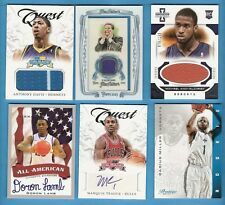 2012-2013 TEAM PINNACLE DUAL ROOKIE CARD (#12) OF. ROOKIE CARD. THE CARD IS NUMBERED 25 OUT OF ONLY 99 MADE. ATS RIGHT ONLY 98 OTHER PEOPLE CAN OWN A CARD LIKE THIS ONE. 2012 Panini Anthony Davis Rookie Card PSA 8. Condition is Like New. Shipped with USPS First Class Package. ANTHONY DAVIS 2012-13 12/13 Panini Limited RC AUTO SSP # /10 RPA 2012 ROOKIE!!! !